Beauty was not a separate value; sometimes it was conjoined with religious values and sometimes with usefulness. Art was not an end in itself but a bridge or a talisman. A bridge — the work changes the reality that we see for another: the sun is a jaguar, the moon the head of a goddess. The work of art is a medium, an agency for the transmission of forces and powers that are sacred, that are other. The function of art is to open for us the doors that lead to the other side of reality. Featuring approximately 170 extraordinary objects of pre-Columbian origin, Ritual Beauty: Art of the Ancient Americas includes ancient vessels, effigy jars, textiles and adornments, clay figures, stone sculptures, and implements fashioned from copper, silver and gold — all offering a window on the aesthetic worlds of Mesoamerica and the Andean region prior to European contact. Curated by Joanne Stuhr, this exhibition aims to provide a better understanding of the aesthetic, social, political, and religious life of the pre-Columbian world in which these exceptional objects were created, as well as an occasion to study, appreciate, and enjoy the artistic achievements of these rich cultures through their material past. Ritual Beauty: Art of the Ancient Americas was made possible through the generous support of I. Michael and Beth Kasser. The exhibition is accompanied by a full-color catalog that documents and contributes new scholarship on the objects in the I. Michael Kasser Collection from eminent experts in the field: Dr. Peter Furst, Margaret Young Sánchez, and Marta Turok. 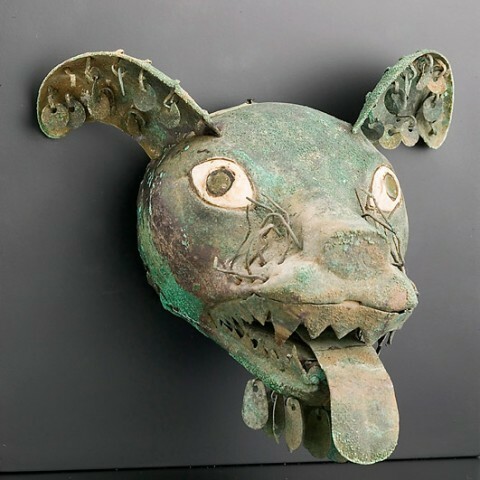 Be one of the first to see Ritual Beauty: Art of the Ancient Americas! Prior to the opening reception, join exhibit curator Joanne Stuhr as she leads the public on a gallery walk through the exhibit. Ms. Stuhr will provide a brief overview of life in the Americas before contact with Europeans and discuss aesthetic and cultural significance of selected pieces in the exhibition. Join us for an afternoon of music and adventure exploring the Art of the Ancient Americas! Grab a gallery guide and investigate Ritual Beauty: Art of the Ancient Americas with your family and friends to discover the purpose and meaning of the artifacts in the exhibit. In the 1 o’clock hour listen to Mayan and Aztec creation stories with educator and storyteller Angela Bennett-Castle. Play with clay to create a mythical character or design a cylinder vessel. At 2pm enjoy traditional Andean music performed by Bwiya-Toli. Panel Discussion: Deciphering Ritual, Cultural and Beautiful Artifacts from the I. Michael Kasser Collection Join UAMA for a lively interpretation of objects from the I. Michael Kasser Collection with Pre-Columbian scholars, Dr. Keith McElroy, Marta Turok and Margaret Young-Sánchez. Each scholar will discuss a collection favorite sharing anecdotes about the objects provenance, historical context, and the artistic virtue of their selection. The conversation will be moderated by exhibit curator Joanne Stuhr. Read the reviews of the Ritual Beauty exhibition and catalog in the Tucson Weekly.